This security poster illustrates the PMN-2 Russian anti-personnel mine. This modern mine was introduced after the PMN. This pressure activated mine features a black ‘cruciform’ rubber cap and incorporates a complicated mechanism, including a bellows to prevent the operation from sudden over pressure. 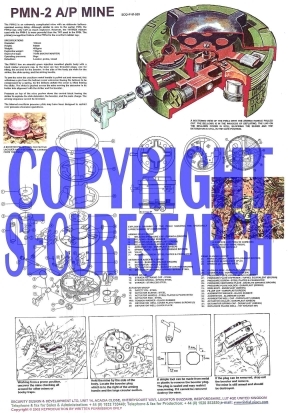 This security poster features the technical specifications of the PMN-2 anti-personnel mine, illustrations and descriptions on how to disarm the PMN-2 anti-personnel mine, an exploded drawing of the PMN-2 showing the unusually large number of components, a sectioned view of the PMN-2 with the arming handle pulled out, a booster pellet with protective lacquer and a detonator carrier from the PMN-2, and a surface laid PMN-2 in Cambodia mud and dust to make visual detection difficult. A sectioned view of the PMN-2 with the arming handle pulled out. A booster pellet with protective lacquer and a detonator carrier from the PMN-2. A surface laid PMN-2 in Cambodia mud and dust to make visual detection difficult. Exploded drawing of the PMN-2 showing the unusually large number of components. Illustrations and descriptions on how to disarm the PMN-2 anti-personnel mine. The technical specifications of the PMN-2 anti-personnel mine. This security poster features the technical specifications of the mine, illustrations and descriptions on how to disarm the mine, an exploded drawing of the PMN-2, a sectioned view of the PMN-2, and a surface laid PMN-2 in Cambodia mud and dust to make visual detection difficult.